Looking for deals in Bangkok? 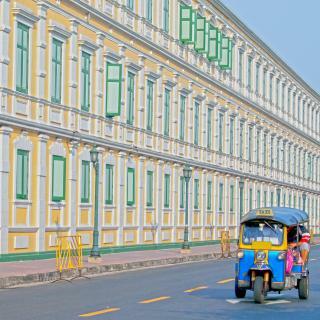 Located in Bangkok Old Town, Chillax Heritage features unique accommodations inspired by the story of the ancient epic, Ramayana. It was very comfortable, the value was great as we booked when they were on their ore-opening and still finishing details of the hotel, rooftop pool, gym, spa tub. Featuring a shared lounge, Bangkok Saran Poshtel is located in Bangkok in the Bangkok Province region, a 14-minute walk from Khao San Road and 1.5 miles from Bangkok National Museum. How nice and neat it is and how the staff are great! It was a 15 minute walk to Khaosan Road. Oriental Heritage Residence features air-conditioned rooms with satellite flat-screen TV in the Bang Rak district of Bangkok. This 3-star hotel offers a 24-hour front desk, room service and free WiFi.... The staff were incredibly kind, warm and welcoming. They knew me by name, and would have little chats with me helping me learn the Thai language as well as just checking in. The room itself felt light an airy like a little oasis from the city. I loved the open bathroom concept. It felt contemporary and helped make the place feel open with little visual space taken up. A favorite of the boutique hotels I've stayed in. Conveniently located in a luxurious area of Bangkok, Grande Center Point Sukhumvit 55 features an outdoor pool and a terrace where guests can relax after their long tiring day. I loved everything about Grande Centre Point Sukhumvit 55 Thong Lo especially the Hosen and Spa. I highly recommend Grande Centre Point. The staff was so warm, friendly, and professional. The location is also great! Conveniently located in central Bangkok, Novotel Bangkok Sukhumvit 20 offers modern and contemporary rooms with free WiFi access. The hotel features 244 rooms and an outdoor pool on the 9th floor. Thoughtful in every aspect, from the moment we entered to our room, the light automatically opened up. And we saw a welcoming card with a signature of the staff that set up our room on our bed. TV automatically playing welcoming video about Thailand culture. This hotel cover many details that a traveler would want, yet it give you a lot of control during your stay. For example, you can choose to have your breakfast inside your room, by simply placing a card on door nob before 3AM. If you'd like your bed linen being replaced, simply put a Bed linen card on it, the staff will know when cleaning up next day. There's a button next to our door letting us to toggle on 'Do not disturb' mode. There's a button to turn on/off the whole rooms light and even a night mode button next to our bed. If you'd like to play your own music in room, the alarm clock itself is JBL Bluetooth soundbox! Slippers are soft, bathing gel and shampoo are Fare Trade product, not to mention the great breakfast buffet, etc.. I would highly recommend Novotel to people, at this price with a up-scale level of service and thoughtfulness. It worth every penny. Located along the Chao Phraya River, Shangri-La Hotel Bangkok features a 10,000-sqm Fitness Center and the multi-awarded CHI, The Spa at Shangri-La. Everything in this hotel is good , like like like for family is good , its far from arab street . An ideal home based in Bangkok, Adelphi Suites offers serviced apartments with concierge service right on Sukhumvit 8. Facilities include a fitness center, an outdoor pool and a restaurant. this hotel was located down a side street next to a seven eleven and a few restaurants. 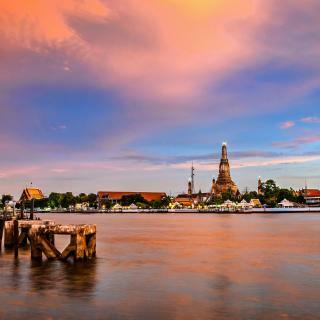 Located within 2.9 miles of Wat Arun, Varmtel in Bangkok has a number of amenities including a garden and a terrace. Varmtel really exceeds my expectations. The room s spacious, and very clean. I love the bed!!! Set in Bangkok, 1.1 mi from Siriraj Hospital, Baan Suan Prannok Residence features air-conditioned accommodations with free WiFi in the public areas. We more than enjoyed our two nights here. Set in the heart of Ladprao area in Bangkok, Apartelle Jatujak Hotel features rooms with free WiFi. Gorgeous room with a welcoming and helpful staff available 24/7. Will definitely book again! K Home Asok is located in Bangkok, in the Wattana district. Around a 19-minute walk from Arab Street, the property is also close to Emporium Shopping Mall. Great location, Rooms were clean and spacious. Staff were friendly and helpful. Guest friendly. Located 1 mi from Grand Palace, Villa Phra Sumen Bangkok features comfortable rooms with warm-toned lighting. The property offers a 24-hour front desk and free WiFi, which is available throughout. Very friendly staff that help you navigate the dense area. Located in the heart of Bangkok Old Town area with a short walk to Democracy Monument and Temple of the Golden Mount, Methavalai Residence has rooms with free WiFi access. Very nice staff. We've got a complimentary plate of fruits on arrival. What are the best hotels in Bangkok near Rajamangala National Stadium? Some of the best hotels in Bangkok near Rajamangala National Stadium include Hive 28, Green House Hostel and The Garden Living. Which hotels in Bangkok are good for couples? These hotels in Bangkok are highly rated by couples: Bangkok Publishing Residence, Sukhon Hotel, and Mandarin Oriental Bangkok. What are the best hotels in Bangkok near Suvarnabhumi Airport? Travelers who stayed in Bangkok near Suvarnabhumi Airport (BKK) have said good things about Miracle Transit Hotel, Novotel Bangkok Suvarnabhumi Airport, and Thongtha Residence - Suvarnabhumi Airport. Which hotels in Bangkok are good for families? Many families visiting Bangkok loved staying at Siamotif Boutique Hotel, Nine Design Place, and Mandarin Oriental Bangkok. Which hotels in Bangkok have nice views? The Peninsula Bangkok, Tower Club At lebua, and Avani+ Riverside Bangkok Hotel got great room view-related reviews from travelers in Bangkok. How much does it cost to stay in a hotel in Bangkok? On average, 3-star hotels in Bangkok cost MYR 201 per night, and 4-star hotels in Bangkok are MYR 403 per night. If you're looking for something really special, a 5-star hotel in Bangkok can be found for MYR 819 per night, on average (based on Booking.com prices). How much is a hotel in Bangkok for this weekend? The average price per night for a 3-star hotel in Bangkok this weekend is MYR 419 or, for a 4-star hotel, MYR 966. Looking for something even fancier? 5-star hotels in Bangkok for this weekend cost around MYR 2,359 per night, on average (based on Booking.com prices). Which neighborhood is the best one to stay at in Bangkok? Sukhumvit, Siam, and Sathorn are popular with other travelers visiting Bangkok. Which hotels are the best ones to stay at in Bangkok? Eastin Grand Hotel Sathorn, Bangkok Saran Poshtel, and Avani+ Riverside Bangkok Hotel are some of the popular hotels in Bangkok. On average, it costs MYR 201 per night to book a 3-star hotel in Bangkok for tonight. You'll pay around MYR 495 if you choose to stay in a 4-star hotel tonight, while a 5-star hotel in Bangkok will cost around MYR 1,320, on average (based on Booking.com prices). 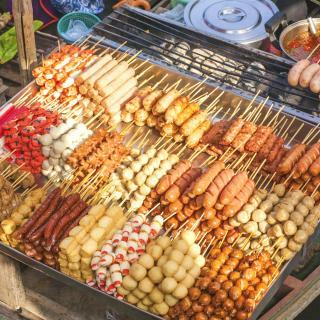 Which hotels in Bangkok offer an especially good breakfast? For hotels in Bangkok that serve highly-rated breakfasts, try Mandarin Oriental Bangkok, Old Capital Bike Inn, and Tower Club At lebua. Catch a boat up river on the Chao Phraya Express or discover different neighborhoods on the blissfully air-conditioned BTS Skytrain. 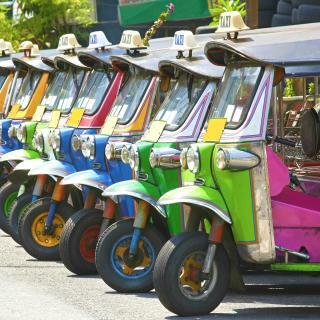 A taxi or exhilarating tuk-tuk ride is never far away from the big attractions, which include Chinatown, Jim Thompson House and the floating markets at Damnoen Saduak. To step out of the frenetic energy of street food stalls, amulet markets and the sizzling temperatures, discover an oasis of calm in one of the many Buddhist temples. 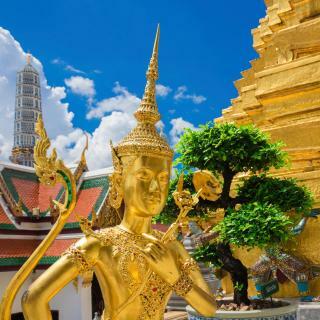 Be awed by the majesty of the Grand Palace and marvel at the world’s longest reclining Buddha at Wat Pho. While you’re there why not relax even more with a traditional Thai massage? 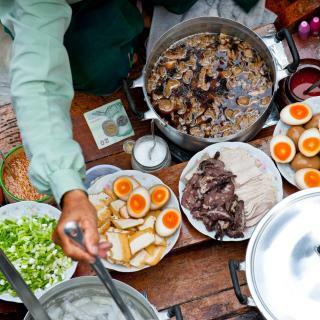 From the sky-scraping luxury hotels with world famous rooftop bars to a cheap hostel bed in the center of town, Booking.com will help you explore all that Bangkok has to offer. The view of the city from the hotel was incredible! Roof top bars... particularly the moon bar at Banyan tree hotel. Chef man restaurant for yum dim sum. Siam Hotel spa ... amazing massages And fantastic Resturant out on the riverfront. Best to plan your day so as to avoid crazy traffic lunchtime and early evening. Take the river boats, not expensive and fun. Stayed at Banyan tree and Sohkathai. Hotels location is very accessible to all part of the city. Overall, our trip is awesome! 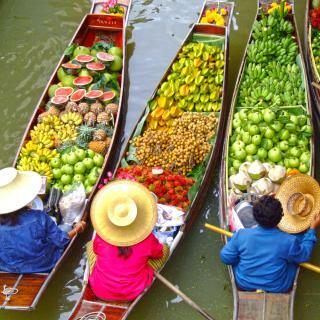 Bangkok is a haven for budget conscious travellers. Thai food is very cheap yet very good. Hotel accomodation very affordable. Tourist attractions are also plentiful. A little drawback is the language barrier. Most Thais can't speak English. I love this hotel. I'm going to the east. (Thailand and Philippines) 2-3 times a year. And at least 1.5 months in Bangkok. This hotel have the best location. Near to all the good big shopping centers. And direct entrance from the hotel to MBK. the staff from the manager to to roommaid and to the guards are fantastic. The public areas are very nice and welcoming. The breakfast just great. Have everything you can think of. And the price.... fair enough. . Each time I stay here between 3 to 4 weeks. And just feel like home. 2nights3Days stay at The Spades Hostel was absolutely wonderful. Spacious room, very comfortable and cozy bed with personal locker, night lamp and curtain and like everything about this place is superb. Location is quite good esp. Just a 10-minute walk to downtown. Will never book and stay at a 3star hotel with private bath room bla blah when I visit bangkok in future because hostels >> hotels. It is a classic hotel along the Choapraya ( King ) River in Bangkok. It is a land mark hotel of Bangkok along with Shia Gri La and Oriental hotel. One could see the river, the furries, the barges up and down along the river. Then the hotel has nice shuttle boat to hover along those 2 hotels and new shopping mall Iconsiam. If one has only 2 days and one night then this the hotel I highly recommend. It was clean and spacious. This is my 2nd visit and also 2nd time staying at the same hotel which is Marriott Bangkok. The staff here are extremely helpful and friendly especially Ms. Ammy, Guest Relation Officer. It is also a very clean and well-layout hotel with facilities in the room well-designed. I’m definitely recommending this to my Friends. The hotel is located very central in Silom. Supermarket is across the the street, and an amazing street food around the corner. Comfortable room, very clean, good view. I didn't book breakfast so cannot say anything about the food at the hotel. I highly recommend Silom City hotel and will book there again, next time I come to Bangkok. The staff is amazing. The most friendly and understanding staff compliment in all of Thailand and I have stayed at a few hotels in Thailand. The level of English is also very high and that makes things alot easier when communicating. Can't wait to stay here again and think I have found my home when visiting Bangkok in the future. Good breakfast, great selection of different cuisines. Really enjoyed the views both from the top of the hotel and from the room. The markets and shops around the hotel gave us one last opportunity to feel the local Bangkok vibe before leaving for airport. Also the Airport Link is a big plus. Location. A decent breakfast. Although we paid half day price for an early check in which other hotels in Bangkok don’t mostly, they forgot about us and they were too busy when we called ro ask for late check out so we got away without paying for a lare check out. Nick’s service is top class. He gave us a trip plan to visit Bangkok and a good direction to go to that places. He is funny and friendly as he was telling lots of stories about Thailand culture. Hotel is very clean and comfortable with a cheap price for laundry. Ideally located in the newer part of Bangkok, near to a terminal 21. Easy to reach between both airports. 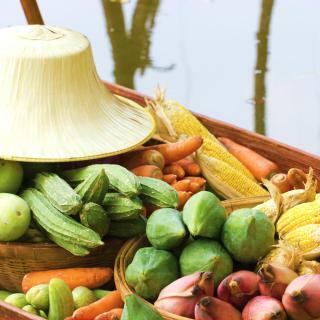 Staff were very friendly, hotel is spotless, room comfortable and breakfast was great, the best we had in Thailand. Price was 55 euro a room that isok. But not sure if this hotel is 5 stars. i sleep before in Bangkok at 4 star hotels that i like more. 1-Clean 2-good location 3-perfect breakfast the best breakfast in all bangkok hotels. Front desk staff was friendly. Breakfast was nice with good spread of choices. Dinning area was very spacious, bright and clean.